World famous poker player; Phil Ivey opened up the new high stakes poker room called the Ivey Room last Saturday. It was really only a matter of time before Phil had his own poker room named after him and it was fitting it was a high stakes one. The Ivey Room is located at Aria in the MGM city centre. 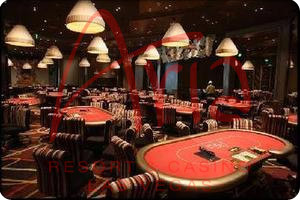 The room is expected to attract the highest stakes poker played in Vegas. The room was opened with a 1 million dollar invite only free roll. After all the cards had been dealt a poker regular Harry Litton emerged the winner and pocketed a hefty $250,000 prize for his troubles. After this he was given the opportunity to win another $250k by playing Phil Ivey heads up. Unfortunately for Litton Ivey was triumphant and Litton had to settle for just $250k in winnings from the free to enter tournament. Other attendees to the opening included Barry Greenstein, Doyle Brunson, Sammy Farha, Phil Laak and David Williams to name just a few of the all star guests. Only time will tell whether the room is successful as Phil hopes. One thing is for sure though, if Phil Ivey is playing at a poker room it is pretty likely that other poker players will follow. This entry was posted on Tuesday, May 25th, 2010 at 6:34 pm and is filed under Poker News. You can follow any responses to this entry through the RSS 2.0 feed. You can leave a response, or trackback from your own site.